It is a proven fact that most human beings love freebies regardless of product or service type. We love to get more value than we pay for. As an eCommerce store owner, using this fact to your gain is very beneficial, because you get more sales and more goods and services exchanged for money. As long as you are still covering your costs, you are sure to make a profit. Often times there are enough holidays or anniversaries to tie discounts and other bonanzas to. Most discounts entail giving a free gift or even giving a fixed amount off the product price. We have written about how to set up discounts, and the different types of discounts you could use to achieve more sales e.g. role based discounts. 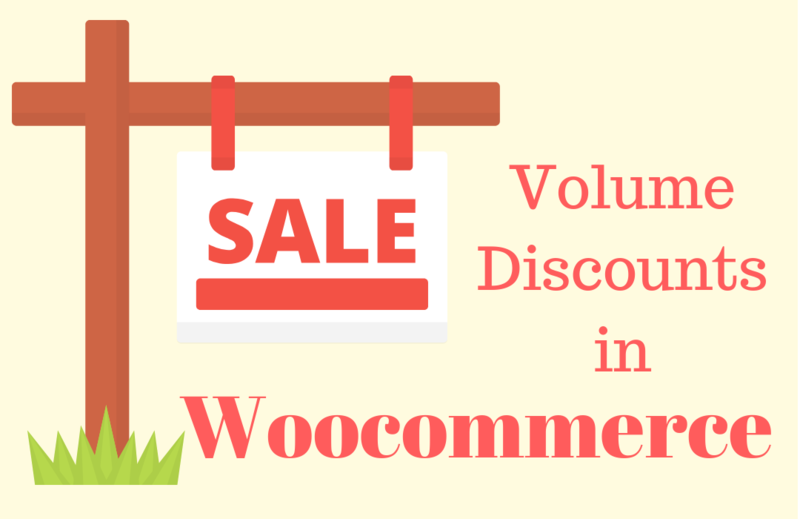 This article will focus on how to set up volume and bulk discounts in your WooCommerce store. What are they exactly? There are different definitions to this phrase, according to the application. Some say that volume discounts are actually BOGOFs: Buy One Get One Free. Others say that volume discounts are in place when the more of a product you buy, the less the unit cost price for each one – this is also called ‘bulk discounts’ because you buy in bulk to benefit from the price reduction. Clearing inventory: volume discounts are the way to go when you need to clear out inventory from your store. You may have goods that may soon expire or goods that are linked to seasons e.g. Christmas. It is best to give out bulk discounts for interested buyers to that such goods are cleared from your store. Attract New Customers: giving out volume discounts ensures a higher interest from customers about the goods and services in question. Everybody wants to reduce costs, and since the unit cost is lessened in a bulk discount, the customer usually chooses your store above others that do not offer such a promo. Retain old customers: clients that have bought goods from your online store will definitely return to buy more when they here there is a volume discount running. To them, it means that they are buying the product even cheaper than before their initial purchase. Every human loves to save money and cut costs. Increased marketing: People love sharing good news, and volume discounts are no exception. Several of your current customers will spread the word about your bulk discounts, even if they never purchased the product before. The fact that they are on your newsletter list, and get to hear of it, will prompt them to tell others, especially if their previous experience was good at your store. This type of volume discount in WooCommerce allows you to define a pricing table per product in order to apply a discount based on the purchased quantity. This feature is available in the product admin page in the Quantity Based Pricing tab. Ensure that the product type is either a Simple or Variable product. The plugin only works with these two types for now. Percentage off product price: defines the discount percentage off the products in the selected list. Fixed amount off product price: defines the discount amount off the products in the selected list. Percentage off order subtotal: defines the discount percentage off the order subtotal. Percentage off order subtotal (including taxes): defines the discount percentage off the order subtotal with the taxes included. Fixed amount off order subtotal: defines the discount amount off the order subtotal. Fixed amount off order subtotal (including tax): defines the discount amount off the order subtotal with the taxes included. Free Gift: defines a list of items the customers can choose from on the cart page as a free gift. Rules type: This field lets you select the type of rule to apply. You can apply the Intervals or the Steps. Interval means that you determine the intervals (between a minimum and maximum numbers. See image above) when the chosen discount type will be applied. ‘Steps’ means in multiples, that is, at “every X items”, apply the selected discount type. Intervals rules: If the quantity ordered is between Minimum and Maximum, then the discount specified will be applied. Steps rules: If the quantity ordered is a multiple of the given step, then the discount specified will be applied. Order products: applies a discount if the customer orders at least one item in the list selected in the value field (Product lists help group particular products together for easier manipulation). At the end of the day, the aim is to attract and retain customers to your store. It is best to give out reasonable discounts now and then. Be sure to factor in your costs and margins so you do not make a loss. Keep a record and eventually, you can tell which type of volume discount your customers responded to the most. Having all the different types of combinations possible using the WooCommerce All Discounts plugin for your WooCommerce store is a lifesaver! Do you agree? Please share your experience in the comments below!